Situated in the picturesque Eixample neighborhood, this stylish two-bedroom apartment in Barcelona offers guests a true Catalan experience. An area that is home to some of Barcelona´s most revered sights, including the towering Sagrada Familia, just one of Gaudí´s masterpieces, is sure to leave visitors speechless. A great choice for couples, families or groups of friends heading to the Catalan capital, this apartment can accommodate up to six people. The modish apartment enjoys a mix of modern and traditional elements, with the parquet flooring, open-faced brick walls and French windows, all adding to the ambience of the charming space. The living room, furnished with a comfy double sofa bed and a TV, offers the perfect spot to unwind after a day of sightseeing. There is also a balcony where guests can choose to soak up some Spanish sun, or simply take in the atmosphere of this ´barrio´ in Barcelona. An Internet connection is also available, making it easy to stay in touch with friends and family back home. The well-equipped kitchen has plenty of the utensils and appliances needed to create your very own home-cooked meal. The apartment has two bedrooms, both furnished with two single beds, and a bathroom fitted with a walk-in shower. 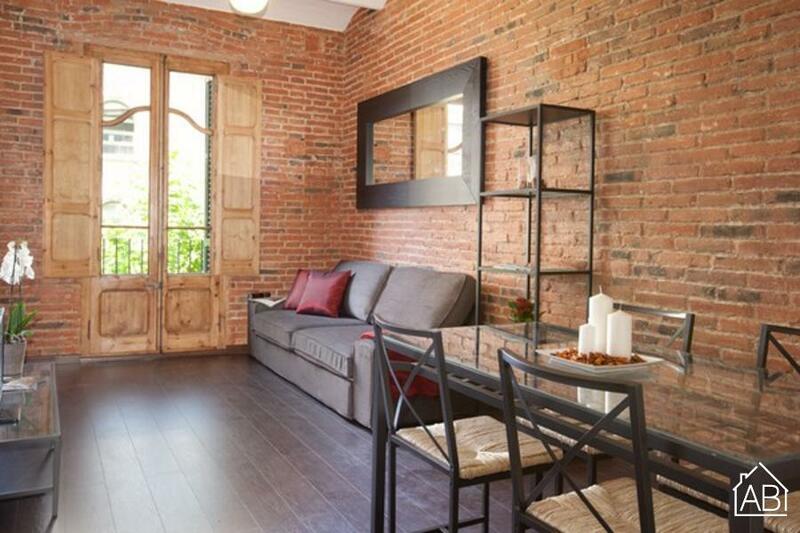 Located in one of Barcelona´s most beautiful neighborhoods, with easy access to all of the city´s sights, this lovely apartment comes complete with heaters and air-conditioning, and is the perfect choice for your trip to the Catalan capital, any time of the year!